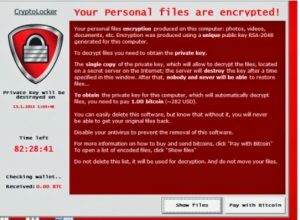 Recently, security experts released a warning reporting about a clear rise in ransomware attacks. 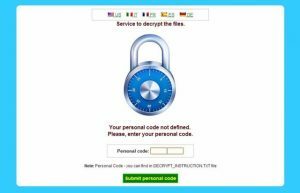 According to their claims, the latest versions of CTB Locker, Cryptowall, Teslacrypt and other ransomware threats have started infecting websites and scrambling their files in exchange for ransoms. It seems that Magento e-commerce platform sites have been the main targets. However, there is no guarantee that WordPress sites’ owners and other admins won’t have to rebuild their websites because of CTB Locker or other ransomware as well. 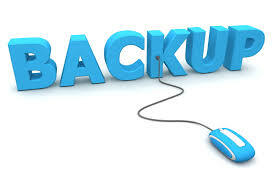 Backing up is the most important thing for protecting the website files, so make sure you do that if you are the admin. The other warning comes from the FFIEC (or US Federal Financial Institutions Examination Council). It claims that ransomware threats have started attacking banks. 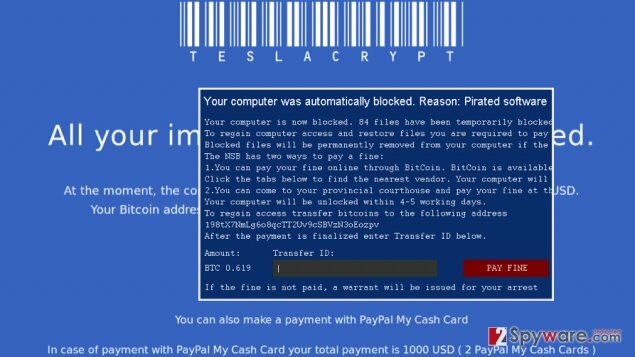 After infiltrating the system, bank-aimed ransomware tries to trick the visitor that FBI, Department of Homeland Security or another governmental authority is asking him or her to pay the fine for an illegal activity on the Internet. Of course, ransomware encrypts files before showing this warning on user’s desktop and asks to pay a ransom of $5000. It has already been estimated that Cryptowall and other ransomware threats can help their owners generate around $400,000 per month, and there is no chance that these numbers will stop growing in the nearest future. Hackers keep improving methods for spreading these viruses around, and it seems that each of operating systems is vulnerable to CTB Locker and other threats from its category (Linux is included). Ransomware protection, just like its elimination, cannot be imagined without a reliable security tool and its latest updates. 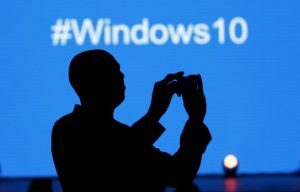 Unfortunately, but, even after installing the most powerful anti-spyware, people fail to update their programs to their latest versions and leave their computers with no protection. Also, users do not follow safe browsing practices. Note that two ransomware distribution techniques are considered the most popular. 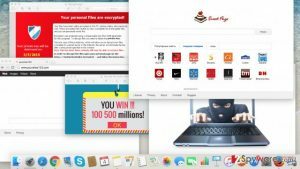 They include tech support scams and affected WordPress sites that redirect visitors to ransomware sources. You should stay away from both of them. Finally, don’t forget to backup your data because that’s the easiest way to retrieve the affected files. If you have your backups, you can be sure that the appearance of ransomware threat won’t leave you without your files. This entry was posted on 2016-06-13 at 05:05 and is filed under News.